Music groups, singing and fun for babies, toddlers and pre-school children with their parents and carers in and around Sevenoaks and Tonbridge. Drop-in classes in local Care homes. 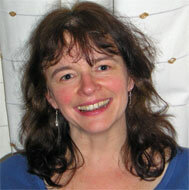 I’m Margaret and lead the team running Musical Bumps in the Tonbridge & Sevenoaks areas. I launched the classes in Tonbridge in 2007, after a career as an Event Coordinator at the Royal Festival Hall and Barbican Centre. I’ve been involved with music all my life – singing in choirs and playing the flute. After a (lengthy!) pause to stay at home with my three lovely children I was ready to face a new challenge when returned to work! I had taken my own children to music groups but I knew the format and progression of Musical Bumps classes together with a social time within the class was perfect. I’m very lucky to have a wonderful team of teachers working regularly with me: Kirsty Black, Jo Brown and Lisa Stevens. None of us could manage without amazing Kate Shorten running the office! As you can see from our timetable below we have lots of classes to choose from. We also enjoy working with local nurseries and schools in the area and can usually be persuaded to run birthday parties too! To try out a class please get in touch to arrange a good day to visit for a free trial and meet the teacher. Older children: if you are interested in finding out more about Tonbridge Children’s Fun Choir for age 4-8 (which is supported by Musical Bumps and led by our teachers) please email tonbridge@musicalbumps.com. To keep up with the latest news, go to our social media tab and join us on Facebook (both our ‘page’ and Group for families), Twitter and Instagram! You can phone us on 07736 244142 or complete this form to book your free trial class. 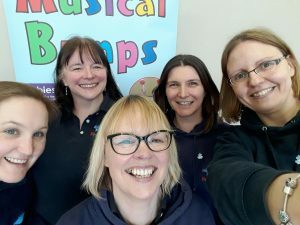 Musical Bumps Tonbridge and Sevenoaks can create a bespoke program of learning for your school or nursery’s specific needs. From one-off workshops or parties, clubs and choirs right through to a full music curriculum for EYFS and KS1. You can rely on Musical Bumps to provide stimulating, ambitious, practical and musical classes and clubs! Please email tonbridge@musicalbumps.com to request a booking form. There is no need to complete the form if you are enquiring about classes, you can contact us direct using contact us tab on this page! CLICK HERE to join our closed facebook group (which is just for Musical Bumps families) to keep up to date and get all our news straight away! Saturday classes for families to enjoy with residents at local Care homes throughout the term. Please contact us for details. St Johns Church, Centre, TN11 9HT. On the main London Road B245 that runs between Hildenborough and Tonbridge. The centre is adjacent to the big church in the middle of the village opposite Sackville School and close to the post office. Turn into the bit of road ‘Foxbush’ set back from the main road by a strip of grass and turn into the Centre carpark. Plenty of free parking. Alice’s is in the parade of shops close to Sevenoaks Hospital, on the junction with Wickenden Road. Entrance to the function room is to the side of the building in Wickenden Rd, behind the cafe. We strongly recommend that if using the St James’s car park TN13 3PE you use the entrance on St John’s Hill opposite Little Poppets and near the betting shop bus stop! Look out for the ‘P’ sign as the entrance is like a narrow driveway but the car park is spacious (40p 1 hour, 60p 2 hours). The other entrance to the car park on St James’s Rd itself is narrow and gets very congested. There is also parking on Wickenden Road. Tonbridge Parish Church is set back from the north end of the High Street(the Castle end. On foot: from the High Street turn into Church Lane by Tonbridge Dental Practice and use either the main doors or double doors to the right. From Hadlow A26: at the junction on Hadlow Road with the left turn to the by-pass GO STRAIGHT AHEAD (onto the A227) until you get to the T junction with Tonbridge High Street. You will see the church/graveyard set back from the road on your left. Kinnings Row car park is to your left shortly BEFORE the T junction. OR turn left into EAST STREET on the bend before Kinnings Row – there are a few parking bays (some are residential). OR turn Left at the T junction onto the High Street and turn Right into the castle car park (signed to swimming pool); walk back to the high street, cross over and follow the passageway next to the Dentist into the church. From Tunbridge Wells via A26: Drive up the high street past the castle on your left. Either turn left into the castle car park (signed to the pool, see above) or carry onto the traffic lights. Turn RIGHT and then quickly right into Kinnings Row car park, or slightly further along right onto East Street for on-road parking. Parking can be tricky the first time you come! There is a small pay & display car park accessed from Kinnings Row off Bordyke. There are some free parking bays on and around Church Lane accessed from East Street. The Castle Pay & Display is about 5 minutes walk – drive in via Castle Street and walk back along Bank Street. Waitrose Car Park is less than 10 minutes walk.